The 2017 corn crop has proven to be challenging. Heavy rains in the early season delayed planting or made replanting necessary in many locations, especially in the eastern corn belt. On top of delayed maturity, late season rains further delayed harvest in many areas of the northern US. Thus, the corn harvest was roughly 40% complete at the end of October, about 20 percentage units behind average. The corn harvest was 90% complete in mid-November, though, only 6 percentage points behind the 5-year average. As is typically true, mycotoxin levels for the 2017 corn crop vary widely by species and among states. As a result of the harvest delays and weather conditions for later-harvested corn, the patterns in toxin levels changed from the initial harvest to the end of season harvest. Fumonisin has been common where a dry growing season was followed by copious rains from tropical storms shortly before harvest. Aflatoxin levels in the southwest are elevated vs. 2016. Other fusarial toxins, including deoxynivalenol (DON, also called vomitoxin), zearalenone, and T-2 toxin are more commonly concerns in states further north, where harvest delays were an added factor for 2017. While deoxynivalenol levels appear to be well below 2016 levels, cool, wet weather present in some regions in early November brought increased risk for the later-harvested fields. Mycotoxins are difficult to sample and measure, so understanding the extent of mycotoxin challenges in feed ingredient sources is vital. Effective mitigation tactics for specific mycotoxins is imperative for the commercial success of affected animal production operations. The strongest trends seen in this year’s Cargill Corn Survey are elevated fumonisin levels in Mississippi, Kansas, Oklahoma, and Texas, higher deoxynivalenol in North Carolina and in a lesser percent of samples from Indiana, and high aflatoxin, primarily in California and Texas. In the maps below, green indicates less than 10% of the samples from that location were above the cautionary level. Yellow indicates more than 10% of the samples from that location were above the cautionary level. Red indicates more than 20% of the samples from that location were above the regulated or Cargill maximum level. Use practical efforts to reduce animal exposure to mycotoxins by minimizing usage of suspect ingredients in diets for young pigs and sows. Seek available mycotoxin surveys of your area to understand general mycotoxin risks in regional and local grain and by-product supplies and ingredients. These reports can provide a guide to understand which toxins may be a risk for your enterprise. Further mitigation tactics should include the following steps. Install a pre-unloading, quick-test procedure using a certified test kit. Sample from multiple locations for representative testing. Implement effective management responses to elevated results, such as rejection or segregation of suspect materials. Since mycotoxin levels generally concentrate in grain by-products, monitor supplies carefully with testing and reduce or eliminate by-products suspect for concentrated mycotoxins. If available, use alternative grain sources (such as sorghum or wheat) that may have lower mycotoxin contamination, but test these sources as well. Plan for multiple mycotoxin types. If you detect one mycotoxin, it is common to have others; fumonisin with aflatoxin and zearalenone with DON are very common combinations. Mycotoxin effects are generally additive and even low levels of multiple toxins can have negative impacts on the immune system. Realize the natural distribution of mycotoxins is not uniform, originating from localized growth of molds in the field or in storage. Understand it is common to see mycotoxin symptoms in only some animals or pens, while others may not be as severely affected or may show no symptoms. Aflatoxin is a highly toxic mycotoxin that decreases performance and overall animal well-being. 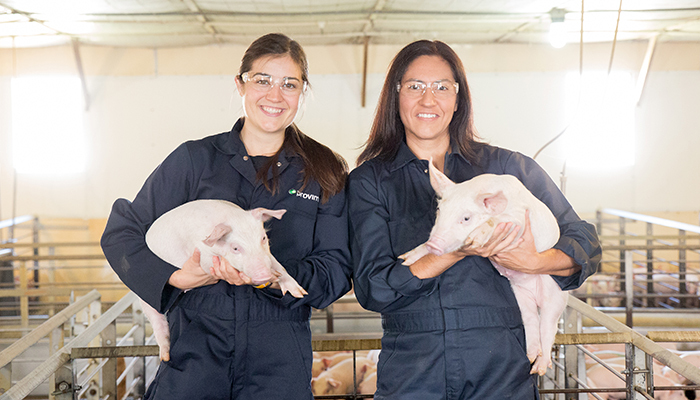 While avoiding the use of feed materials with aflatoxin levels above 20 ppb for pigs and sows and 100 ppb for finishing pigs is legally required, even low levels of aflatoxin can enhance the impact of other mycotoxins. At high levels (>1000 ppb), acute signs include slab-sided pigs, depression, difficulty walking, and death. Deoxynivalenol is a relatively common mycotoxin, especially in the northern half of the US and in Canada. Fumonisin can be found in corn-producing areas throughout the US, but is most common in the southern half of the US. Fumonisin starts to show impacts at 10 ppm in complete swine diets. True fumonisin poisoning usually presents as “sudden death” in growing pigs with good body condition, when the diet contains over 100 ppm of fumonisin. Fumonisin seems to be more problematic in combination with other toxins, especially aflatoxin. While not an apparent risk this year per the Cargill Corn Survey’s current data, zearalenone is another key mycotoxin for animal production. Also known as the reproductive mycotoxin, zearalenone and related compounds are most harmful for the breeding herd. Their estrogenic effects produce a range of changes to the reproductive tract that can disrupt reproductive performance. When zearalenone risk is known, it is advisable to monitor grain and grain by-products being used in sow and boar diets and to eliminate any known contaminated ingredients from the diets of reproducing animals. Zearalenone is often found in conjunction with DON and/or Gibberella ear rot in corn. If higher concentrations are fed during the first two weeks of the post-mating period, embryo development ceases, and the sow will appear to never have been bred. Return-to-estrus time may be prolonged by many weeks. Understanding mycotoxin risks by following regional survey results, monitoring ingredients, managing suspect ingredients, and employing mitigation tactics is essential for productive and profitable operations. Working with your nutrition team to determine the best measures for managing mycotoxins is key when feeding livestock. Assistance can include formulation and nutrition solutions. PROMOTE® additives are part of the nutrition solutions provided by Cargill, Provimi, and Citura. PROMOTE® is a dependable line of feed additives and unique services for the livestock and poultry industries. Contact your Cargill, Provimi, or Citura representative for more information on PROMOTE® additives or call our PROMOTE® Customer Service representatives at 866-202-9889. Check out our new website, feedpromote.com.